, a celebrated painter, was born at Geneva, May 18, 1668. He was originally educated for the church, but his inclination soon led him to painting, in which he made a rapid progress. He painted miniature with success, and when he came to Paris in 1688, he obtained the favour of the duke of Orleans, who chose him for an instructor in the art, and gave him an apartment at St. Cloud, that he might be with him more frequently. He was likewise highly favoured by the princess Palatine, the duke’s mother, who presented him with her own picture set with diamonds; and also gave him recommendatory letters to the court of Great Britain, | particularly to the princess of Wales, afterwards queen Caroline. Her portrait was universally admired, and celebrated by several of the poets; and, at his return to Paris, he was loaded with presents, among which were many medals of gold. Having copied a Leda, perhaps the famous Leda of Corregio, destroyed by the bigotry of the regent’s son, all Paris was struck with the performance. 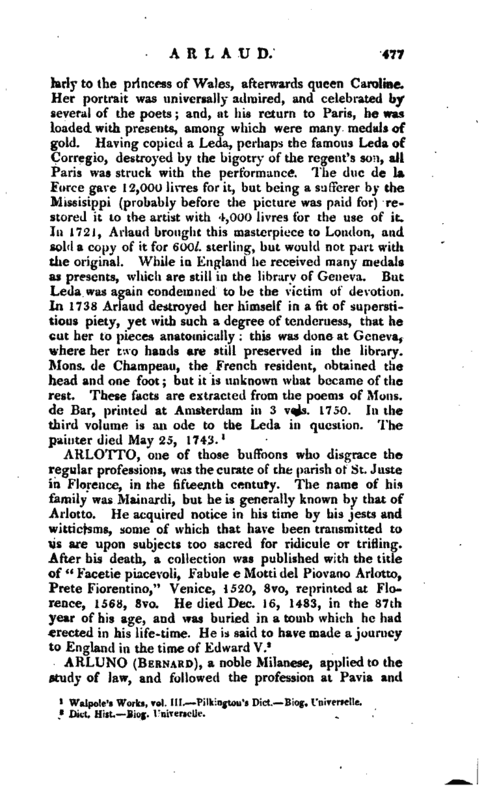 The due de la Force gave 12,000 livres for it, but being a sufferer, by the Missisippi (probably before the picture was paid for) restored it to the artist with 4,000 livres for the use of it. In 1721, Arlaud brought this masterpiece to London, and sold a copy of it for 600l. sterling, but would not part with the original. While in England he received many medals as presents, which are still in the library of Geneva. But Leda was again condemned to be the victim of devotion. 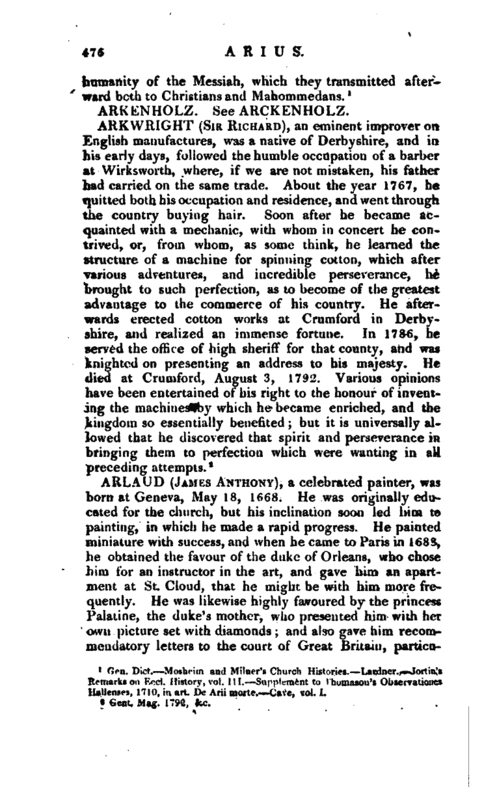 Walpole’s Works, vol. III. Pilkington’s Dict. Biog. Uiviverselle.